The Concrete Decor RoadShow connects world-class talent, innovative brands and solutions in decorative concrete with construction professionals across the continental U.S.
Turnkey access to a targeted audience of concrete professionals who will interact with your brand and experience hands-on education led by iconic industry trainers. Valuable third-party endorsements at national, regional and local levels that are backed by the promotional power of Concrete Decor. Proven brands, products, solutions and talent in decorative concrete — recommended by experts, specified for your business and delivered to your location. A powerful tool for promoting technical education, attracting new business and driving product sales. 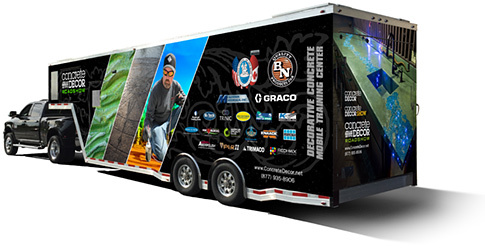 Promotional support by Concrete Decor magazine built into the program to help maximize success.